The ABC writers have done it again. While watching Desperate Souls, did you catch any Storybrooke secrets? Well, guess what! We did!! When Emma goes to confront Mr. Gold at his pawnshop about the fire, there is a large Mickey Mouse figurine. It can be seen at the bottom left section of the screen. Not only that, a smaller Minnie Mouse is sitting on the table to the right of Mr. Gold. 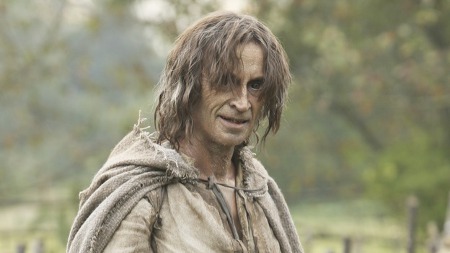 The Dark One’s name is revealed to be Zoso when Rumpelstiltskin took the dagger. The name Zoso references Led Zeppelin. This is a moniker for Jimmy Page, the Zeppelin guitarist. The force field that attacked the neighbor’s mother and father when trying to save their daughter from the Duke reminded us of the force field around the developed town on LOST. What did you think? At the Duke’s castle, a tapestry was shaped like a seahorse. Could this be a reference to the little mermaid? This is what we found so far. How about you? Nice catches. I also saw some things about Sheriff Graham in the box that Mr. Gold had. Like Graham’s last name was Humbert, which was the name of the huntsman in Disney’s Snow White. I also read the who front page of the newspaper and discovered that Emma was 17 on June 16, 1996 and that’s when she committed some crime.